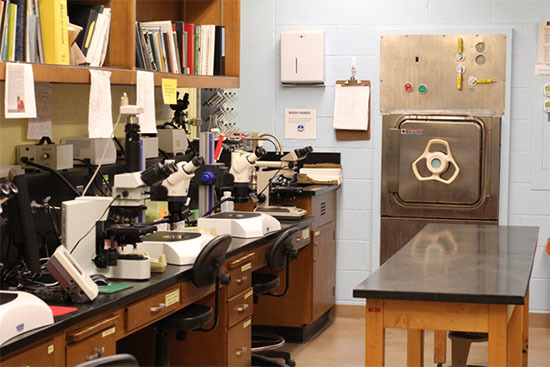 Plant Clinic services include plant and insect identification, diagnosis of disease, insect, weed, and chemical injury problems (chemical injury on field crops only), nematode assays, and help with nutrient related problems, as well as recommendations involving these diagnoses. Microscopic examinations, laboratory culturing, virus assays, and nematode assays are some of the techniques used at the Plant Clinic. Many samples can be diagnosed within a few days. Should culturing be necessary, isolates may not be ready to make a final reading for 10-14 days. Nematode processing may also require a few days to a few weeks depending on the procedure. Final reports include identification and diagnoses, along with management recommendations for treatment of the pest or pathogen problem. Please refer to our website at http://web.extension.illinois.edu/plantclinic/ for additional details on samples, sample forms, fees, and services offered. If you have questions about what, where, when, or how to sample call us at 217-333-0519. When submitting a sample, please provide as much information as possible on the pattern of injury in the planting, the pattern on individual affected plants, and details describing how symptoms have changed over time to cause you concern. Pictures of the affected plants or areas can also be sent with the sample to give us a better idea of what is occurring in the environment. Our fees vary depending on the procedure necessary. Please note, our prices increased slightly this year. General diagnosis including culturing is $18, ELISA and other serological testing is $25, nematode analysis for SCN or PWN is $25, specialty nematode testing (such as corn) is $45, and SCN resistant screens are $60-120 depending on size. Please contact us if you are uncertain of which test is needed. Checks can be made to the University of Illinois Plant Clinic. Also new this year, credit card payments are now accepted online after a sample is completed. You can drop off samples at S-417 Turner Hall. Park in the metered lot F 28 on the east side of Turner or at the ACES Library metered lot on the west side of Turner. Come in the South door and take the elevator located in the SE corner of the building to 4th floor. 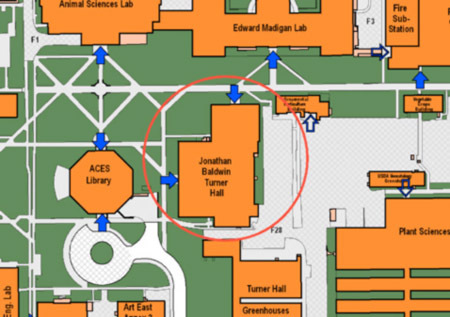 Turn left when exiting the elevator; we are located along the south corridor of the 4th floor. Please use the green drop box located just outside S-417 if we are temporarily out of the office.